The Session is a monthly project where a bunch of beer bloggers all blog about the same topic. You can read more about the project here. This is PintLog's second time contributing to the project (I wasn't able to source a beer for the 26th session in time). This month's hosts are Joe Ruvel & Jasmine Smith (the good people behind Beer At Joe's), and the topic they have chosen is Beyond the Black & Tan, a meditation on beer cocktails. Ah, the beer cocktail. Loved by many, hated by just as many; they're always a conversation starter. Some people think they're a great way to experience beers in a new way, others think it's a sacrilegious waste of good beer. I guess I'm kind of in the middle on this one. While I haven't tried that many different mixes, the ones I have range from outright nasty to pretty decent. It's very rare that I finish a beer cocktail and think, "Wow, that really offered something enjoyable over just enjoying those beers back-to-back." Most of the time, I'm just left a little confused. You can find plenty of lists of beer cocktails online, just google "beer cocktails." When deciding what to make for this article I read through list after list, looking for something that sounded interesting. I ended up picking a cocktail that I have a lot of experience with for a baseline and one composed of two beers that sounded truly awesome together. On a logistical sidenote, to help make an attractive and properly separated beer cocktail, I like to use the Brutool Turtle. 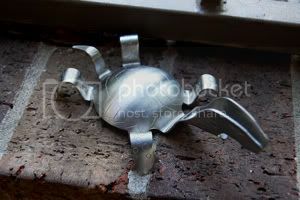 Much easier than a bent spoon, this thing works so well that even my bulldog could pour a decent Black & Tan. Let's check out the two recipes I decided to make for this exercise, and how they turned out, shall we? First up, the control for this experiment. No matter how cliché, I just had to include the beer that started it all, the Classic Black & Tan. 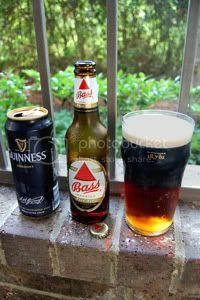 While any mixture of Stout and Pale Ale is considered a Black & Tan, Guinness Draught and Bass Pale Ale are the beers used in the "classic" version. Both beers are solid enough traditional British session beers with distinct, yet complimentary flavor profiles, so the match is a bit of a no-brainer. It starts off as a more caramel-and-hops tinged version of Stout, and by the bottom of the pint becomes a more roasty and dry English Pale Ale. Each phase is interesting and the flavors always mesh well. While not the most exciting pint in the world, it's easy to see why Black & Tans are by far the most popular beer cocktail out there. You can read my full Classic Black & Tan Review here. Next up, the Chocolate Truffle, a mixture of Young's Double Chocolate Stout over Lindemans Framboise. I was quite excited to try this mix as I'm a fan of both beers and think the combination sounds like a match made in heaven. Unfortunately, the reality isn't quite so heavenly. For the first half of the pint, the flavors are very muddled and just don't mesh like I was hoping they would. 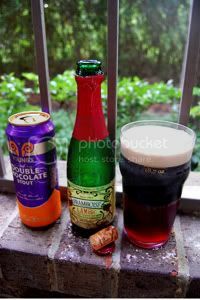 Once the Stout is almost gone, it livens up a bit and the tart raspberry flavors start to cut through the mess, but it still offers nothing better than the Framboise by itself. You can read my full Chocolate Truffle review here. So, after reviewing two very different beer cocktails, did I learn anything? Well, the thing that really stuck out to me was that there's a lot more to matching two different beers than two different Jelly Belly jelly beans. While some matches sound good on paper, beer is such a complex thing that the reality doesn't always follow your expectations. Chocolate Stout and Framboise just sounded like a wonderful match, but ended up muddy. Guinness and Bass sounds like an old boring couple, but each beer was able to compliment the other, making something actually worth the time to mix. I agree, the black and tan was really good and the other one was terrible. I'd certainly like to try some different mixes.